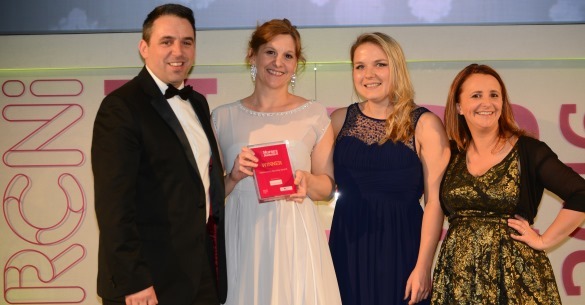 SEQOL’s specialist nursing team based in Swindon has won the country’s top award for community nurses. The deep vein community nurse specialist team were presented with the RCNi Community Nursing Award at a recent ceremony at Westminster Park Plaza Hotel. The team, managed by nurse specialist Jo Boyd, who is the UK’s first nurse to be trained as a DVT sonographer, led the transformation at SEQOL specialist treatment centre using ultrasound to confirm or exclude deep vein thrombosis (DVT) in the community. Before Jo made her pioneering suggestions to develop the service, almost all patients with a suspected DVT would be put on anticoagulants and had to wait for a hospital-based scan for diagnosis. In 2014, a total of 1,476 patients received an average of three unnecessary doses of anticoagulants while waiting to be screened and only one in 25 patients with suspected DVT were receiving ultrasound within four hours of assessment. Patients waiting for an ultrasound were anxious and needed daily anticoagulant injections, yet only 14 per cent of these patients had DVT confirmed. Jo gained competence in ultrasound scanning and saw the opportunity to speed up the diagnosis by providing a scanning service based in the community which enabled patients to be assessed, diagnosed, treated and reviewed in one place – with a much shorter time to diagnosis. She took the suggestion to the SEQOL executive team, which supported it. It has been an incredible success with patients being assessed, scanned and diagnosed on the same day at SEQOL’s Moredon Medical Centre in Swindon. Before SEQOL introduced the new way of working, only 20% of patients received a scan within 24 hours and only 4% at initial consultation – these figures are now 97% and 94% respectively, and written feedback from patients is consistently positive. Jo and her colleague Lucy Reynolds accepted the Superdrug-sponsored Community Nursing RCNi Award. Jo said: “We were absolutely thrilled to win, although we were surprised because there were so many strong candidates also up for the award. It’s a fantastic accolade for the entire DVT team, and we’re very proud to have had such an impact on patient care, and to have had it recognised on a national platform. Julie Sylvester, editor of specialist journal Primary Health Care, who was on the shortlisting panel said: ‘The RCNi Nurse Awards are a wonderful way to recognise those who innovate in their practice to make a difference to patient care.